Jindalee is an outer suburb of Brisbane, Australia 12 km (7 mi) south-west of the Brisbane CBD, and is a part of the Centenary suburbs. It is bordered by the Brisbane River to the north. The Aboriginal meaning for Jindalee is “bare hills”. Jindalee was the first of a series of suburbs originally called the “Centenary” suburbs, as planning for them commenced in 1959, the year of Queensland’s centenary. 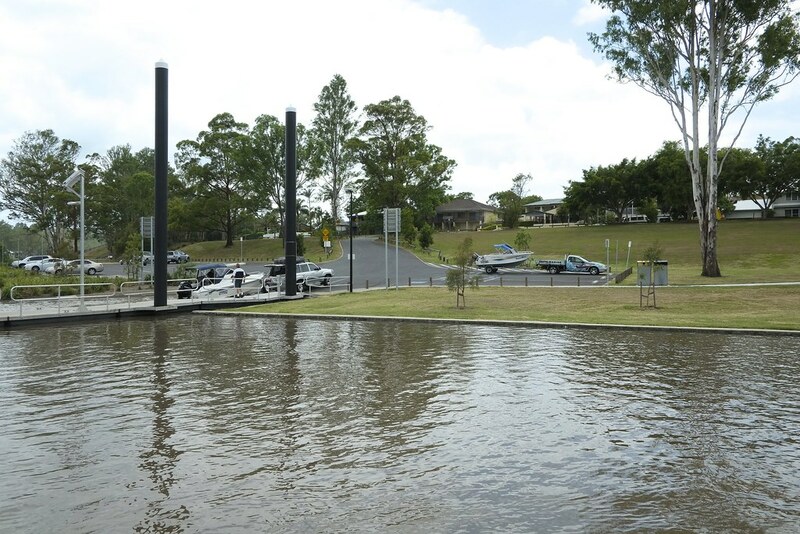 The Jindalee Boat Ramp Park is a busy spot on weekends, with all ages enjoying the lovely green space and facilities on offer here. With a double boat ramp, pontoon and car park close by, boaties are well catered for. Electric barbecues and picnic shelters spread throughout the park provide the perfect opportunity to enjoy a relaxed breakfast or lunch, right beside the river. A generous sized playground sports modern play equipment for kids of varying ages and nearby tables and chairs mean Mum and Dad can sit and chill out whilst still keeping an eye on their young charges. Right next to the playground is a large, flat, grassed area that’s perfect for kicking the footy, throwing the frisbee or enjoying a game of cricket. For those looking for a bit of a workout, exercise equipment can be found in a spot that affords a bird’s eye view of the river. And for those with a 4 legged friend, there’s an offleash dog area attached. Indooroopilly is a suburb of Brisbane, Australia 7 kilometres (4.3 mi) west of the Brisbane central business district. The suburb covers 7.5 km². The suburb is designated as a regional activity centre. Indooroopilly boasts significant commercial, office and retail sectors and is home to Indooroopilly Shopping Centre, the largest shopping centre in Brisbane’s western suburbs. The suburb is popular with professionals and a large number of university students from the nearby University of Queensland campus in St Lucia. The housing stock consists of a mix of detached houses and medium density apartments. There has been a trend towards increasing small lot and townhouse development in the suburb in recent years. Nevertheless, many post-war homes and iconic Queenslanders have also been restored. Brisbane City Council regulations to preserve the ‘pre-war’ look of Brisbane discourage destruction of many of Brisbane’s Queenslanders and buildings. It is one of the Brisbane City Council’s proposed Major Centres. There is a café and restaurant precinct along Station Road between the shopping centre and railway station as well as to the east of the railway station. There are two cinema complexes in Indooroopilly, the Eldorado cinemas on Coonan Street and Event Cinema Megaplex inside Indooroopilly Shopping Centre. This cinema complex once had 8 cinemas, now it boasts 16. It is the major cinema complex in the Western Suburbs. Indooroopilly youth organisations include the Indooroopilly Scout Group including Rovers and Indooroopilly Girl Guide District Indooroopilly is also home to one of Brisbane’s oldest Soccer Football Clubs, Taringa Rovers. The Indooroopilly Golf Club is a 36-hole championship course offering members and guests a variety of competition and social golf. Toowong is an inner suburb of Brisbane, Australia, which is 5 kilometres (3.1 mi) west of the Brisbane CBD. At the centre of Toowong is a commercial precinct including Toowong Village and several office buildings. The remainder of the suburb is predominantly residential with a mix of medium density dwellings and detached houses. Toowong is situated between Mount Coot-tha and the Brisbane River and is made up of rolling hills with little flat land. Since European Settlement most of the land has been cleared for residential and commercial use with the exception of some park land and bushland near the Western Freeway. Toowong has two main drinking establishments, the Regatta Hotel and the Royal Exchange Hotel, both of which are historic hotels. The three storey Regatta hotel contained accommodation on the upper two floors and a public bar and lounge area on the ground floor. In 1965 a protest took place in the public bar of the Regatta Hotel when Merle Thornton (mother of Australian actress Sigrid Thornton) and another woman chained themselves to the bar in protest of public bars in Queensland being restricted to men only. The Toowong Municipal Library Building was built 1961 on Coronation Drive opposite the Toowong pool, and was formerly the district library for the western suburbs. The library was also designed by Brisbane City Chief Architect James Birrell, and is one of the few remaining examples of his work. The library is now uased as commercial premises. The building comprises a two storey library surrounded by trees and landscaped terraces, with cavity brick lower floor, the structure is formed by three intersecting circles. Above this base floor is a ‘floating’ crystalline form with 12 sided polygon (dodecagon) floor plan whose external walls taper outward as they rise and which houses the principal public floor of the library. The external steel wall framing of the upper floor is diagonally braced, and sheeted with plywood panels set within the structural framing and framed with silky oak beading. The library originally had a hemi-spherical skylight above its centre, which has now been replaced by an enclosure for mechanical equipment. Taringa is a suburb of Brisbane, Australia 5 kilometres (3.1 mi) south-west of the Brisbane CBD. Taringa is mostly residential, except for a small number of commercial buildings mostly clustered along Moggill Road. It is a popular neighbourhood among the students of the University of Queensland and the Queensland University of Technology because of its proximity to the universities and to Brisbane city. The suburb name ‘Taringa’ is a combination of two Aboriginal words: tarau (stones) and nga (made up of). Together, they mean “place of stones”. Taringa is dominated by a ridge that runs the length of Swann Road, with steep slopes on either side of the ridge. The Fulton Residence is a heritage-listed detached house at 209 Indooroopilly Road, Taringa, City of Brisbane, Queensland, Australia. It was designed by Charles William Thomas Fulton for his own use and was built in 1940. It was added to the Queensland Heritage Register on 27 October 2000. The Fulton House is a modified example of the International style in the materials, detailing and asymmetrical massing. It is a two-storey buff-coloured brick house with contrasting red brick to the lower levels and a terra cotta tiled roof. A large box gutter is concealed behind a deep fascia board and this combined with the horizontal raked joints and the concrete balcony and steel balustrade serves to emphasise the horizontal lines. The chimney is built in a red brick emphasising the vertical line.